Sarah Butler joined the Fascial Connections team in November of 2017. Sarah has specialized training and interests in Oncology (cancer rehabilitation) and Women’s Health. She earned her Master’s degree in Physical Therapy at Queen’s University after completing a Bachelor of Science in Human Kinetics at University of Ottawa and a Master of Science in Neuroscience at McGill University. 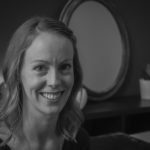 She has pursued post-graduate education in Lymphedema Therapy, Myofascial Release, CranioSacral Therapy, Reiki, and Acupuncture to provide more holistic care to her patients. As a Certified Lymphedema Therapist (135 training hours of study and training in Complete Decongestive Therapy), Sarah can help to safely and effectively assist patients with lymphatic disorders through Complete Decongestive Therapy (manual lymphatic drainage, compression therapy, individualized exercise prescription and self-care education). Sarah is also registered as an Assistive Devices Program (ADP) Authorizer in order to assist people in applying for funding assistance when purchasing compression garments. In the coming months Sarah will be continuing her training in Myofascial Release and Pelvic Health. Sarah is here Tuesdays and Thursdays. Ladies, ladies, ladies, let’s talk about BREASTS!!! !